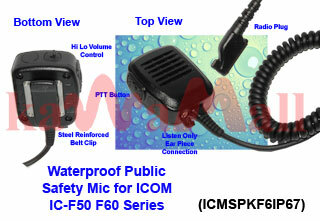 Picture 1: WATER PROOF Public Safety Speaker Mic for ICOM IC-F50 F60 series radios with 3.5mm_Ear_Piece connection. Offered here is ONE (1) new good quality aftermarket Public Safety WaterProof Remote Speaker Mic. It enables you to talk and listen without having to remove the radio from your belt. The speaker mic comes with a PTT button. Keeps your communication alive and active in the rain or water. This speaker mic is waterproof up to 1 meter deep for 30 minutes. Belt clip is reinforced with steel plate. It swivels 360 degrees. Just clip the speaker mic where convenient and use it to listen and transmit. Conveniently placed at the top of the mic so you can turn down the volume without having to fiddle with the radio controls. Picture 1 Single speaker headset with ergonomic PTT button.